Here’s the card we made at the party in Baldwin, MD last Saturday. We used Night of Navy, Whisper White and Brushed Silver. I’m going to keep this short as we’re sick here in our house again. Thank you for stopping by! Pretty! I love those ornaments! Hope you’re soon better…………. Really pretty! I want that impressions folder. How do I purchase the delightful decorations set and the newest ideas catalog? Thanks so much. Thank you for visiting StampThat.com and leaving a comment! 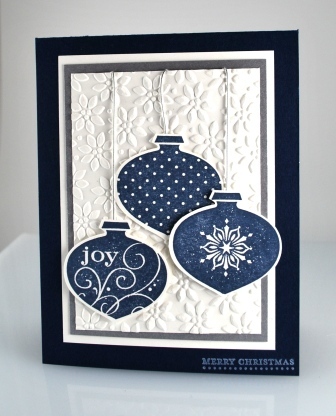 The Delightful Decorations stamp set was available for purchase during the Holiday Mini catalog. I’m afraid it is no longer available. Perhaps the set will reappear in the new catalog in July. If not, demonstrators will be allowed at that time to sell their used sets. I hope you will check back with me then. As far as getting a new catalog, I would be happy to help you out with that. Please email me and let me know where you live?